We buy junk cars, vans, SUVs, and trucks and pay cash in Oregon! Oregon is a beautiful, progressive, forward thinking state. Oregonians are known for their passion for keeping the state and our planet sustainable. That’s why when they have an old junk car sitting around in their driveway, they don’t try and drive it in Crater Lake just to dispose of it. Instead, they call The Clunker Junker because we pay cash for cars in Oregon and pick them up for free. Our junk car buyers are committed to making sure cars are disposed of in an environmentally friendly way by properly draining all fluids, and recycling the raw materials for re-use. Did you know that Oregon is one of the most pedestrian and cyclist friendly states not only in the USA, but in the world? Cutting back on driving is a huge step to reduce our carbon footprint. If you live in one of the bigger cities like Portland, you might not need a car at all! So whether your car is broken or wrecked, or it’s just sitting and collecting dust because you don’t need it, give us a call when you are ready to sell your car in Oregon. We’ll be happy to buy your junk car, tow it away for free, and fill your pockets with cash in the process. Have you heard about the legendary treasure on Neahkahnie Mountain? Oregonians have been searching for this mythical treasure for generations, but no one has yet been able to find it! What if we told you there was an easier way to find your own personal treasure chest? It might even be sitting in your front yard. That’s right, we’ll pay you cash for junk cars in Oregon, and you won’t even have to put together a search party to scour the Oregon coast for decades to get it! Our junk car removal specialists will arrive within a few business days in most cases and put cash in your pocket. It doesn’t get much better than this! It’s easy to get cash for your junk car, no matter where you are in Oregon. 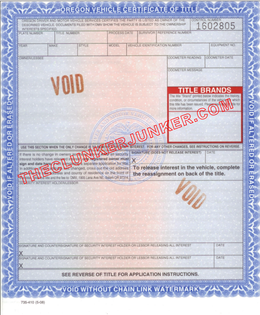 By using The Clunker Junker, you can ensure that you get the best value for your junk car by working with junk car buyers all across Oregon. To get started, you’ll need to provide us with some information. Our online form will get you started. Just enter the year, make, model, and trim for the vehicle to begin the estimate. Next, we’ll need information about the condition of the car – does it start? is there body damage – and the mileage. Be sure to provide accurate information. If you don’t have the car title, we may be able to help – about 10 percent of the cars we’ve bought in Oregon didn’t have a title associated with them. For most vehicles, we’re able to provide you with an instant quote. By working with auto salvage yards across Oregon, we can compare prices and get you the most cash for your car. In some cases, we may ask for additional information. Generally, this is in the form of pictures to prove the condition and/or ownership and is most common for newer vehicles. While we aren’t able to buy every car submitted to us, you’ll be able to know right away rather than having to wait on a quote. As part of the process, we provide junk car removal services in Oregon. Once you’ve accepted the quote, we typically can send out a driver within 48 business hours to pick it up. Sometimes we’re even able to get out there on the same day. We’ll collect additional information from you – address, name, VIN, and the color of the vehicle – and then work with you to schedule a pickup. Once the junk car buyer arrives, drivers will do a cursory inspection of the vehicle to ensure everything is in order. Then they’ll collect documentation, load it on to the tow truck, and had you the cash or check. There’s no waiting period or hidden fees – you’ll know exactly what to expect when the driver arrives at your location. Here at The Clunker Junker, we do the work for you. By working with several junk yards and auctions, we’re able to offer you the best price right away. This is the vehicle that no one can argue is anything other than pure junk. You have no use for it anymore, so why not get it out of the way and put some cash in your pocket? These clunkers are recycled for their raw materials and can get you anywhere from $50 to $140. Some junkers still have parts that carry value and can be used again. Cars or trucks in this category are parted out and then turned to scrap metal and will typically earn you even more cash than the pure junk. What if it’s Not Junk? You can still contact us! Even if your vehicle isn’t junk, we can still offer more than other junkyards in Oregon. There’s a wide range of possibilities here, depending on the condition of your car or truck. You might see as much as $10,000 for a vehicle in this category. If you want to know more about what your car is worth, try out our online tool and get an instant quote. 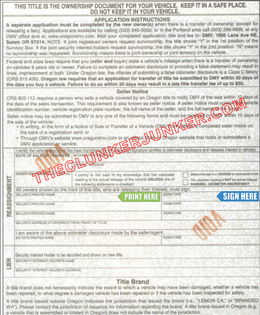 We have put together a simple guide and example for how to sign your Oregon title when you are selling your vehicle. If there are multiple owners listed on the title, they must all sign the title unless the names are separated with "OR". Are you ready to sign your Oregon title? Turn it over to the back side and find the section that says "Reassignment". This is where you'll want to sign and print. Make sure you don't write anything in the section that says "Lien". First, print (don't sign) your name on the back of the title where it reads "SELLER'S PRINTED NAME". Next, sign the back of the title where indicated by "Signature" (see image). 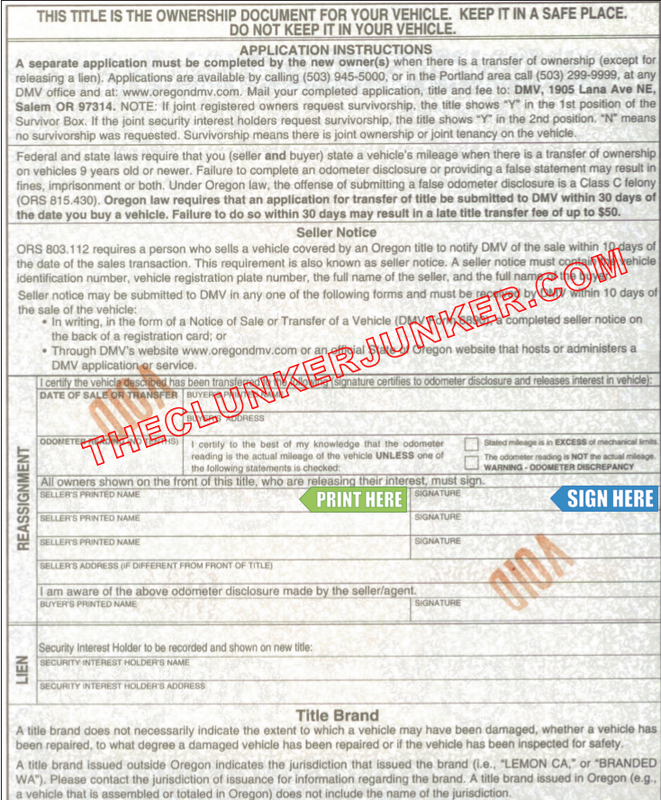 Fill out the Oregon Application for Replacement Title. Please note that there is a seven to ten day waiting period before a duplicate title can be issued and the cost is $77.00. (Paid to the OR division of motor vehicles). Getting rid of an abandoned vehicle in Oregon can be a difficult process. Unfortunately, you cannot just sell any junk car that ends up on your property if you do not own it. You'll need to follow the Oregon abandoned vehicle removal procedures. We have given a general overview of what that entails below. To have an abandoned vehicle removed from your private property, you must first affix a notice to the vehicle stating that the vehicle will be towed if it is not removed within (72) seventy-two hours. If the vehicle remains unclaimed, the owner of the private property must create and sign a form that includes a description of the vehicle to be towed and the location of the property from which the vehicle will be towed. By law, you cannot claim ownership of an abandoned vehicle on your property. Do you buy cars in Oregon with no title? Yup! We buy tons of cars without title. However, offers are almost always lower and you’ll need to prove you own the vehicles. Most buyers require you to present a photo ID and a matching, valid registration in lieu of title. Please note that we cannot guarantee our buyers will be able to buy every car without title and they reserve the right to refuse any vehicle. Oregon often changes their title documents from year to year. If you have questions about your specific title, please contact your Oregon DMV. 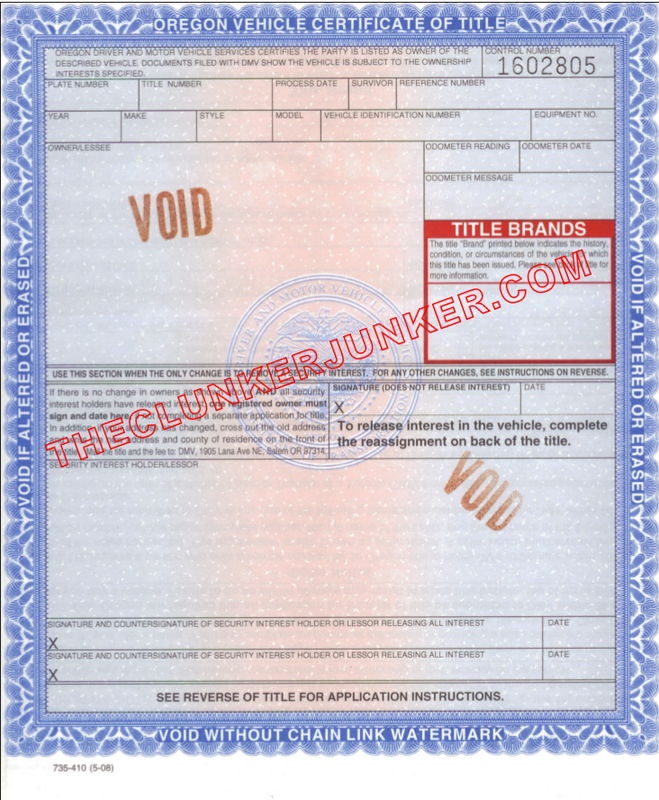 The Clunker Junker can provide you with a fast and easy quote for your junk car. If you’re looking to sell your junk car in Oregon, reach out to us today through our online tool. We’re Oregon’s trusted junk car buyers. "I'm moving out of state, and I need the cash. The interior is kind of torn up, but it runs, and it's not in bad shape. One tire is a donut, and the flat tire is in the trunk." "The vehicle was a daily driver up until a week ago. I think it's just the starter going out. Everything else has been great. It just had the brakes and oil changed, and I have owned the car for 10-plus years." "The vehicle has damage to the front passenger side. It was in an accident a while back, so the airbags deflated. We have still been driving it ever since then, but it died and will not start. " "The front bumper has been replaced. The vehicle will start but will not stay started. It needs new engine mounts, a fuel injector, and there is something wrong with the 02 sensor. It has a loud rattle when it is idling, if you can even get it to idle." "I'm junking the vehicle because it's taking up space in my dad's driveway. It is facing the front side. The van does start and run, but after 20 minutes, you start hearing a clunking noise. As of now, the van has been sitting for four months, so the car won't start without a jump. " "All of the lights, mirrors and bumpers are intact and on the vehicle. There are very few scratches, and it has a dented hood. The engine is in good condition, but it has a bad alternator. All components are there." The Clunker Junker is one of the top junk car buyers in the state of Oregon. To date we have made instant offers on over 20 thousand vehicles across the state, totaling over $4 Million offered! Of those vehicles, approximately 11% were purchased without a title. We also buy cars on a wide spectrum of conditions and 61% of the vehicles we've made offers on in Oregon do not start or drive. Many also have moderate to severe body damage. Salem in Fulton County was our top producer, followed by Portland.